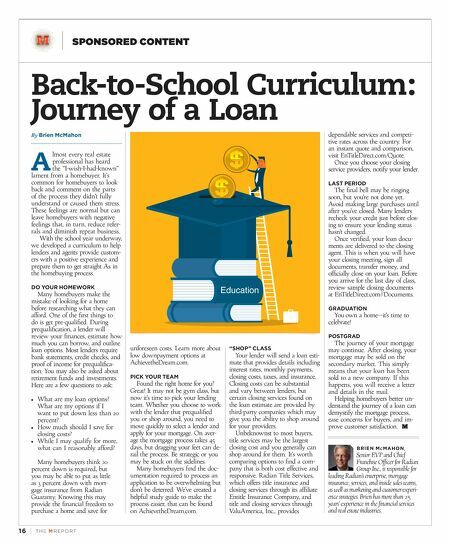 16 | TH E M R EP O RT SPONSORED CONTENT Back-to-School Curriculum: Journey of a Loan By Brien McMahon A lmost every real estate professional has heard the "I-wish-I-had-known" lament from a homebuyer. It's common for homebuyers to look back and comment on the parts of the process they didn't fully understand or caused them stress. These feelings are normal but can leave homebuyers with negative feelings that, in turn, reduce refer - rals and diminish repeat business. With the school year underway, we developed a curriculum to help lenders and agents provide custom- ers with a positive experience and prepare them to get straight As in the homebuying process. DO YOUR HOMEWORK Many homebuyers make the mistake of looking for a home before researching what they can afford. One of the first things to do is get pre-qualified. During prequalification, a lender will review your finances, estimate how much you can borrow, and outline loan options. Most lenders require bank statements, credit checks, and proof of income for prequalifica- tion. You may also be asked about retirement funds and investments. Here are a few questions to ask: • What are my loan options? What are my options if I want to put down less than 20 percent? • How much should I save for closing costs? • While I may qualify for more, what can I reasonably afford? Many homebuyers think 20 percent down is required, but you may be able to put as little as 3 percent down with mort- gage insurance from Radian Guaranty. Knowing this may provide the financial freedom to purchase a home and save for unforeseen costs. Learn more about low downpayment options at AchievetheDream.com. PICK YOUR TEAM Found the right home for you? Great! It may not be gym class, but now it's time to pick your lending team. Whether you choose to work with the lender that prequalified you or shop around, you need to move quickly to select a lender and apply for your mortgage. On aver - age the mortgage process takes 45 days, but dragging your feet can de- rail the process. Be strategic or you may be stuck on the sidelines. Many homebuyers find the doc- umentation required to process an application to be overwhelming but don't be deterred. We've created a helpful study guide to make the process easier, that can be found on AchievetheDream.com. "SHOP" CLASS Your lender will send a loan esti- mate that provides details including interest rates, monthly payments, closing costs, taxes, and insurance. Closing costs can be substantial and vary between lenders, but certain closing services found on the loan estimate are provided by third-party companies which may give you the ability to shop around for your providers. Unbeknownst to most buyers, title services may be the largest closing cost and you generally can shop around for them. It's worth comparing options to find a com - pany that is both cost effective and responsive. Radian Title Services, which offers title insurance and closing services through its affiliate Entitle Insurance Company, and title and closing services through ValuAmerica, Inc., provides dependable services and competi - tive rates across the country. For an instant quote and comparison, visit EnTitleDirect.com/Quote. Once you choose your closing service providers, notify your lender. LAST PERIOD The final bell may be ringing soon, but you're not done yet. Avoid making large purchases until after you've closed. Many lenders recheck your credit just before clos - ing to ensure your lending status hasn't changed. Once verified, your loan docu- ments are delivered to the closing agent. This is when you will have your closing meeting, sign all documents, transfer money, and officially close on your loan. Before you arrive for the last day of class, review sample closing documents at EnTitleDirect.com//Documents. GRADUATION You own a home—it's time to celebrate! POSTGRAD The journey of your mortgage may continue. After closing, your mortgage may be sold on the secondary market. This simply means that your loan has been sold to a new company. If this happens, you will receive a letter and details in the mail. Helping homebuyers better un - derstand the journey of a loan can demystify the mortgage process, ease concerns for buyers, and im- prove customer satisfaction. BRIEN M CMAHON, Senior EVP and Chief Franchise Officer for Radian Group Inc., is responsible for leading Radian's enterprise, mortgage insurance, services, and inside sales teams, as well as marketing and customer-experi - ence strategies. 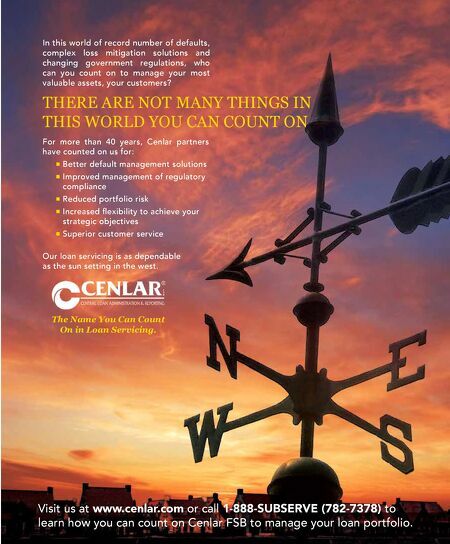 Brien has more than 25 years' experience in the financial services and real estate industries.